If you’re around here a lot, you may have noticed that I have a thing for stories about people who are rejected, not for their deeds, but because they are somehow different. The Phantom of the Opera, the Hunchback of Notre Dame, and the Creature of Mary Shelley’s Frankenstein. I can’t remember the last time I read Frankenstein…college, maybe? Not as an assignment, just around that time. My chief memory was that I enjoyed the book, but I hated Victor. I recently reread the book, and…yeah. Really good book. Hated Victor. Victor Frankenstein, already a dying man as the story opens, imparts to the reader the tale of what laid him low. After an idyllic childhood in his native Geneva, he went off to college and pursued an obsession with the “natural sciences.” This culminated in an experiment in which he successfully gave life to a creature he fashioned. Victor is horrified by the Creature’s ugliness the moment he comes to life, and flees the laboratory. The Creature disappears and Victor, with a shudder, goes about his life–until his young brother is murdered, and Victor realizes the Creature is to blame. More tragedies later, Creature and creator confront one another at last, and in an extended story-within-the-story, the Creature relates his experiences. (Unlike the movie version, he’s extremely eloquent.) He sought acceptance and instead was met with rejection, until at last he turned with rage upon his creator. And from there we enter what could almost be a Shakespearean tragedy, with the body count rising and the “hero” falling apart in mind and body. First, a note on the writing style. This is a very 1800s novel–the writing is flowery and at times slow (we don’t even get to Victor until 25 pages in, counting the Author’s Foreword) and the most exciting moments sometimes pass with little description. However, on the whole, I like this style of writing. It reminded me a lot of Charlotte Bronte, whose writing I love. Even though Frankenstein is, in many ways, a catalog of horrors, I find this particular writing style soothing–and somehow those two facts didn’t contradict each other in a problematic way! Now, on to the meat of the thing–I hate Victor. He’s whiny, spineless, and narcissistic, and it’s that last point that really gets me. He spends most of the book moaning about his guilt and his pain–and his pain is always so much greater than anyone else has ever felt ever. I don’t deny him his pain, but I feel like his comments have a tendency to deny everyone else their pain. And even though he goes on and on (and on) about his guilt, I never felt like he really took responsibility for the situation (at least not until near the end). He feels terrible guilt for the crimes of the Creature, but he doesn’t do anything to try to stop him. And I felt like he never really owned up to the real crime, and I’m not sure if that’s a product of his character, or if Shelley intended the book differently than I read it, or if it’s some kind of gulf of understanding across the centuries. Victor blames himself for creating the Creature. I blame him for abandoning the Creature. To look at it metaphorically…it’s as if an unwed-mother (which would be a big deal in the 1800s) deeply, bitterly regretted conceiving a child, but never once thinks that maybe she shouldn’t have abandoned the infant on a windy doorstep, and that the child grew up to be a murderer not because of the circumstances of his conception, but because of the abandonment. So. I can’t stand Victor. And I am deeply sad for the Creature–and deeply sad that there is nothing I can call him except the Creature! The choices are pretty much creature, monster, demon or fiend. Victor (and the book) never calls him anything else, leaving “Creature” as the most neutral of the choices. I do acknowledge that the Creature committed heinous acts and I don’t excuse those! But I still see him as the real tragic figure of the book. Chapters 11-16 (almost a quarter of the total) are devoted to the Creature’s story, and I thought it was the most moving section. Abandoned at “birth,” the Creature is at first motivated by that most human (word used deliberately) of impulses, the desire to connect, to love and be loved. After being repeatedly spurned due to his ugly appearance, he at last despairs and lashes out. But no one ever does feel emotions of benevolence. And maybe the moment that really makes me hate Victor is when he assumes, with no cause or evidence, that the Creature murdered his brother. It turns out he’s right (which makes me a little annoyed with Shelley), but that’s irrelevant–he assumed guilt. Everyone assumed guilt the moment they saw the Creature…so of course he went on to fulfill their expectations. If you can’t tell by now, this book made me think quite a lot–and that’s a good thing! I would absolutely recommend it, because even though I hated Victor, I enjoyed the reading very much…if I can use the word “enjoyed” to describe a book I found very tragic and moving. This reread affirmed for me that, in my Phantom retelling, when I mention the books on the Phantom’s shelf, Frankenstein should be one of them–and also that it’s really, really not good for Erik to be reading this. 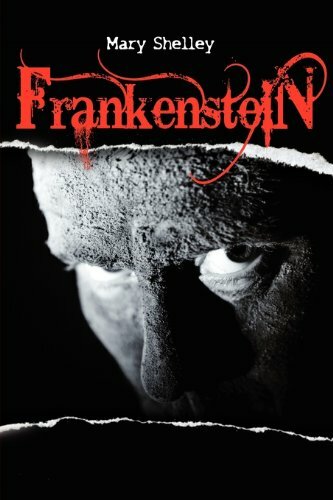 This also gave me a new perspective on the cultural misconception around Frankenstein’s name, which is often attached to the “monster.” Frankenstein was the scientist, not the Creature–but in a sense, the Creature is Frankenstein’s son, which should give him a right to inherit his father’s name. Especially since he was never given a name of his own. I’m embarrassed to admit I’ve never read the novel. But it has always amazed me that it was written by a 19-year-old woman. Then again, Shelley was hardly your average young woman of her day! I like the ending of your review – that the Creature really SHOULD be called Frankenstein since he is, in a very real sense, the scientist’s son. Sounds like this classic has stood the test of time quite well. I have one bit of advice for anyone who sets out to read this novel or the first time. A modern editor would have told Shelley to delete the opening chapters or at least trim them significantly. She wrote in a different era, when there wasn’t such an expectation that a novel should jump quickly into the action. Therefore, if you find yourself getting bored in the beginning, stick with the book anyway. It’ll get much better. This is pretty much what I remember of the novel, Victor culpable of all that results from his actions but feeling not a victor in his endeavours but a victim. I’ve got an annotated paperback of the first edition, apparently a little different from the later version we’re all now used to. I’m looking forward to seeing what those differences are and whether Victor is a blackguard from the off. Oh, I bet Victor was always a blackguard! Its been years since I have read Frankenstein but it is probably still my favourite horror novel. You’ve reminded me I really need to re-read this.